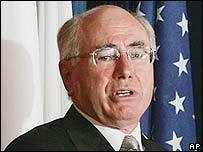 Australian PM John Howard has criticised what he called a small number of Australian Muslims who "rave on about" jihad. Aspects of Muslim culture posed new challenges for immigration and integration policies, Mr Howard said. "There is a fragment which is utterly antagonistic to our kind of society, and that is a difficulty," he said. Australian Muslim leaders condemned the comments, which were printed two months after anti-Lebanese riots in Sydney. Mr Howard spoke to The Australian newspaper shortly before violence erupted in the suburb of Cronulla in December, but his remarks have only now been published. However, he expressed concerns that some aspects of Muslim life were incompatible with Australian cultures and traditions. "You can't find any equivalent in Italian, or Greek, or Lebanese, or Chinese or Baltic immigration to Australia. "There is no equivalent of raving on about jihad, but that is the major problem." Attitudes towards women were also problematic, Mr Howard said, although he did concede that young Muslims were moderating their views. "For all the conservatism towards women and so forth within some of the Mediterranean cultures, it's as nothing compared with some of the more extreme [Muslim] attitudes." The head of the Australian Federation of Islamic Councils, Ameer Ali, said only a "tiny fraction" of Australian Muslims justified Mr Howard's concerns. "The timing is bad, with protests against the [Danish] cartoons and things going on all over the place, it inflames the situation," he told the Reuters news agency. "It doesn't help us to continue with the great work we are doing in this country to achieve a harmonious society." Mr Howard welcomed new statistics showing that 24% of Australians were born outside of the country, saying it proved his government has operated a non-discriminatory immigration policy. Mr Howard is to mark 10 years as prime minister next month. 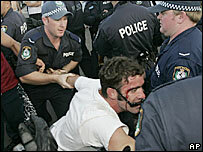 How serious are the Sydney riots?